My square of backwards knitting is the tightest, followed by plain knitting, and the loosest by a long shot is purling. This would explain the mysterious "rowing out" on the wrong side of my stockinette fabric. I'm going to play around with more swatches until I get 2 that are the same size, so's I can become a master. My next step is to purl with extra finger wraps to see if that tightens me up a little. The redesigned website and swank new logo have now been revealed for all the world to see. I love my little yarn ball 'R'! (See below) I hope you like what you see. I will gradually be adding new brands and items as I move to doing this site full time. Murphy's Law has struck me, and my site update that was supposed to be done a week ago is taking much longer than anticipated. If you'd like to purchase a pack of Wabisa-Beads, please email me at natasha@grittyknits.com! I will bill you through Paypal, or give you a discount coupon to purchase them directly through me when I get the kinks worked out. Give me Wabisa-Beads or give me death! The web update should be coming any day now… once we sort out a couple of bumps along the road. When the switch happens, www.GrittyKnits.com will take you directly to my store, but you’ll still be able to get to my blog by clicking around. If you’d like to get a discount on some of my grand opening merchandise, be sure to sign up for my mailing list. I’ll be bribing you to buy from me with coupons and what not. There were many others in the shape of flowers & animals, but this one was my favorite. I finished my first pair of wearable socks this month and have already started on another pair. 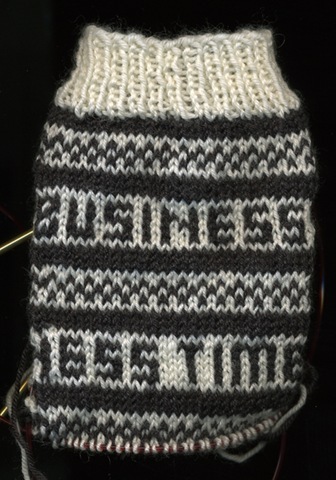 (“Business Time” socks, inspired by Flight of the Conchords, which I am currently obsessed with.) I’ve never been much of a sock knitter but since they’re small enough to keep in my purse, I always have a project with me. I had no idea that I had been wasting so much free time not knitting; it only took me a week or two to complete the pair. I am VERY excited that the Woolie Ewe will be hosting 3 full days of classes with Lucy Neatby May 6-8. I will be working those days, so hopefully when the organization and customer wrangling is done, I will be able to catch most or all of the teaching. I am also putting hot pink & purple streaks in my hair, and encouraging other attendees to do so as well. If you’re a Lucy fan and a Ravelry member, come join my Neatby Knitters group.